I remember it well --- the first time I heard 'Girls Go Wild', the 1979 debut album on Chrysalis Records from The Fabulous Thunderbirds. I thought it was a fantastic set of blues from the first time we spun the platter on our turntable, and nothing since then has changed my mind. It remains the best thing this venerable band has ever recorded. I was living in the Washington, D.C. area back then and was a semi-regular at shows by some of the other local blues bands like The Nighthawks and The Charlottesville Blues All-Stars. But hearing 'Girls Go Wild was a revelation, with their mix of Texas shuffle and Excello-influenced Louisiana swamp blues. We went to see the T-birds in concert shortly after the album was released --- for the mere cover charge of only $2. The price of admission included a souvenir pin-on button promoting 'Girls Go Wild' --- I've still got that button somewhere. 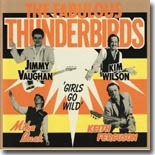 Back then, The Fabulous Thunderbirds consisted of bandleader, singer and harmonica player Kim Wilson, guitarist Jimmy Vaughan (none of us had yet even heard of his soon to be famous little brother, Stevie Ray), bassist Keith Ferguson, and drummer Mike Buck. Wow --- what an ensemble! This original lineup was together from 1976 until 1980, at which time Buck was replaced by drummer Fran Christina. The album starts out with a Wilson original, the mid-tempo blues shuffle "Wait On Time," showcasing Wilson's strong vocals and Vaughan's stinging Texas guitar. The second cut goes goes down to Louisiana with an excellent cover of Slim Harpo's seminal "Scratch My Back," starting out with Wilson's swampy harmonica. In the same vein is the cover of Jerry McCain's "She's Tuff," with Wilson contributing the same "huh huh huh" laugh as on the original. Vaughan's tough blues guitar is featured on the slow blues "Full-Time Lover," while Wilson demonstrates more soulful range on vocals here. Another great example of Vaughan's guitar work is on the feel good tune, "Walking To My Baby," on which Wilson sings, " ... I've got to get to my baby, She lives cross town, She's the finest thing for miles around ..." What a great tune! Wilson most prominently shows off his harmonica prowess on the instrumentals "Pocket Rocket" and "C-Boy's Blues." The re-issued version of 'Girls Go Wild' on Benchmark Recordings includes three bonus cuts --- Magic Sam's "Look Whatcha Done," "Please Don't Lie to Me," and "Things I Forgot to Do," a reconfigured version of Guitar Slim's classic "The Things That I Used To Do." The addition of the three extra songs makes this album even more of a valuable keepsake. Girls (and boys), go wild, and get this classic album for your collection now! All contents Copyright � 2011, Blue Night Productions. All rights reserved.